This credit ADD-ON contains 5000 Helix Credits. 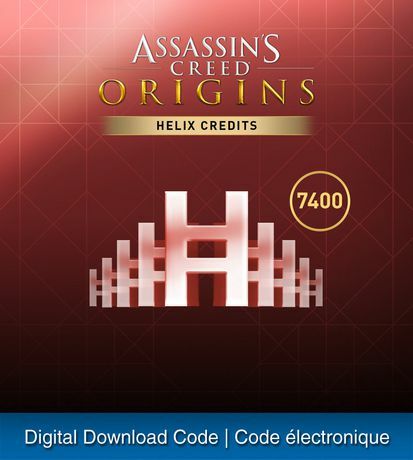 Gain 2400 extra credits for a total of 7400 Helix Credits! Helix Credits can be used to unlock extra items, in-game currency, resources and more. This downloadable content requires PS4 ASSASSIN'S CREED ORIGINS. Downloadable content is nonrefundable and nonreturnable. When you purchase this item an electronic code will be emailed to you by Codes 2 GO Inc., normally within 24 hours after completing your purchase. You will not be shipped a disc or other physical goods. Please ensure to provide the correct email address when placing your order. This content is digitally downloaded through Playstation Network. Once the game has been purchased, you will be emailed your redemption code and instructions regarding installation. You will then need to register through the Playstation Network in order to download and play.